Research is defined as a “systematic, intensive study directed toward fuller scientific knowledge of the subject studied.” (Blake 1978). Research can either be pure, undertaken to develop knowledge and contributor to existing theories or applied, which seeks to address issues of application and solve practical problems (Fellows and Liu 2003). A research methodology consists of a combination of process, methods and tools that are used in conducting research in a research domain. According to Blake (1978), methodology includes the assumptions and values that serve as a rationale for research and the standards or criteria the researcher uses for interpreting data and reaching a conclusion. Research methods are at the basis of the production of knowledge in any given field (Dubé and Paré 2003). A research process involves understanding research domains, asking meaningful questions, and applying valid research methodologies to address these questions. Research follows a pattern of “problem, hypothesis, analysis, and argument.” During research design, one has to decide the methodological approach in finding solutions to the research problems or questions (Fellows and Liu 2003). Research methods most applicable to the construction domain include action research, surveys, case studies, experiments and ethnographic research (Fellows and Liu 2003). With the advent of information technology in the AEC domain, construction research needs to adopt research approaches and methods that better serve their research purpose. Research domains such as information systems are sufficiently broad that they require a wide range of methodologies. Information systems research approaches were explored for adoption in this study. Information systems research is generally interdisciplinary concerned with the study of the effects of information systems on the behavior of individuals, groups, and organizations (Galliers et al. 2007). An applied research discipline, information systems benefits from employing “plurality of research perspectives to investigate information systems phenomena” (Orlikowsky and Baroudi 1991). Action research methods are also very applicable in IS research (Baskerville and Wood-Harper 1996). According to Hevner et al. (2004), two paradigms characterize much of the research in the Information Systems (IS) discipline: behavioral science and design science. The behavioral science paradigm seeks to develop and verify theories that explain or predict human or organizational behavior. The design-science paradigm seeks to extend the boundaries of human and organizational capabilities by creating new and innovative artifacts (Hevner et al. 2004). March and Smith (1995) proposed a framework for researching different aspects of Information Systems including outputs of the research and activities to carry out this research. They identified research outputs as follows: 1) constructs which are “concepts to characterize phenomenon”, 2) models that “describe tasks, situations, or artifacts”, 3) methods as “ways of performing goal directed activities”, and 4) instantiations which are “physical implementations intended to perform certain tasks”. The defined research activities as: 1) build an artifact to perform a specific task, 2) evaluate the artifact to determine if any progress has been achieved and 3) theorize and justify theories about artifacts developed. Similarly, Nunamaker et al. (1991) advocated the integration of system development into the research process, by proposing a multimethodological approach that would include 1) theory building, 2) systems development, 3) experimentation and 4) observations. Figure 3-1 presents Hevner et al.’s (2004) conceptual framework for understanding, executing, and evaluating IS research combining behavioral-science and design-science paradigms. The framework focuses on development of artifacts by applying theoretical knowledge and knowledge of requirements from the environment or context of application. Figure 3-1. 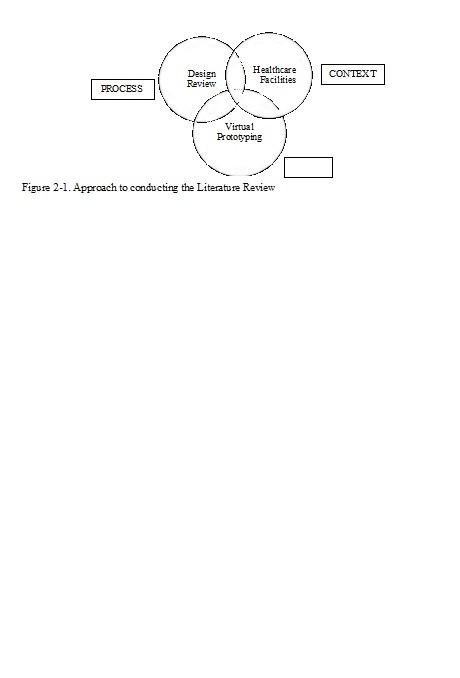 IS Research Framework (Source: Hevner et al. 2004). Systems development is a multimethodological approach to information systems (IS) research (Nunamaker et al. 1991). System development serves both as a “proof of concept” for the fundamental research and provides an artifact that becomes focus of expanding and continuing research. The multimethodological approach to IS research proposed by Nunamaker et al. 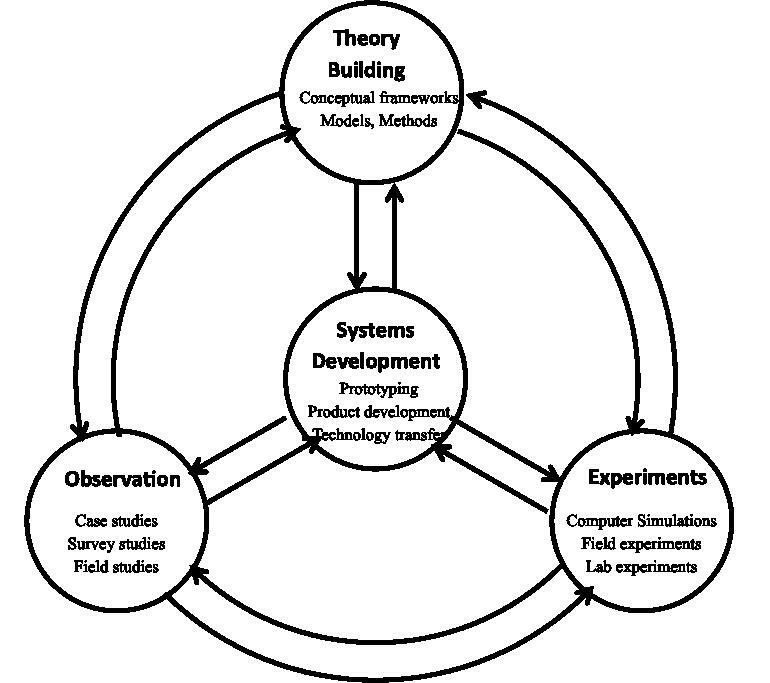 (1991) consists of four research strategies: theory building, experimentation, observation and systems development (Figure 3-2). Figure 3-2. 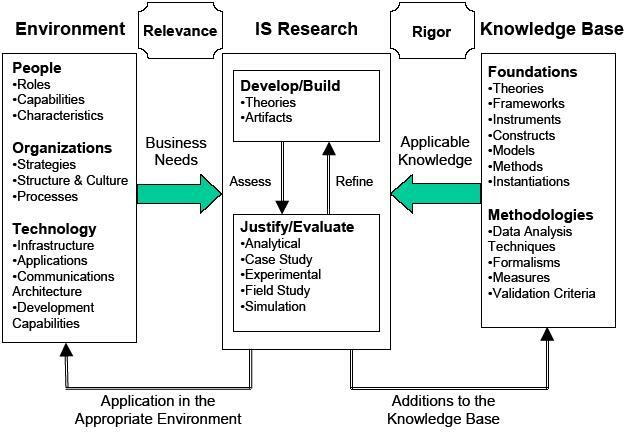 Research approach (Source: Nunamaker et al. 1991). Theory building includes development of new ideas, concepts, and construction of conceptual frameworks, new methods or models. Theories may be used to suggest research hypotheses, guide the design of experiments, and conduct systematic observations. Observations include research methodologies such as case studies, field studies and sample surveys. It may help researchers to formulate specific hypotheses to be tested by experimentation, or to arrive at generalizations that help focus later investigations. Since research settings are more natural, more holistic insights may be gained and research results are more relevant to the domain under study. Experimentation includes research strategies such as laboratory and field experiments as well as computer simulations. It bridges the gap between theory building and observation as experimentation helps validate underlying theories or issues of technology transfer and acceptance. 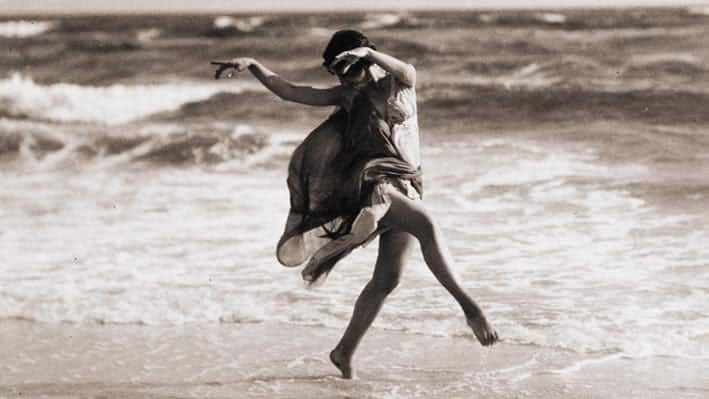 Experimental designs are guided by theories and facilitated by systems development. Results from experimentation may be used to refine theories and improve systems. Systems development consists of five stages: concept design, constructing the architecture of systems, prototyping, product development, and technology transfer. Systems development is the hub of research that interacts with other research methodologies to form an integrated research process (Nunamaker et al. 1991). Advancement of information systems (IS) research and practice often comes from new systems concepts. In engineering system domains, the concept at issue is viewed for its application value rather than its intrinsic value. The concept with wide range applicability goes through a research life cycle of the form: concept – development – impact. Much IS research demonstrates such a life cycle (Nunamaker et al. 1991). Their paper suggests that “theories” are needed to identify broad classes of things that can be done more efficiently or effectively, “instantiations” are needed to provide a continuing test bed for theories, and that “evaluations” of particular instantiation (systems) are needed to quantify the success or failure of the system in both technical and social terms. Systems development provides the exploration and synthesis of available technologies that produces the artifact, which functions as a bridge between technological research referred in the study as the “concept” stage and social research, which has been referred to as the “impact” stage. Initially, literature from various domains of experience-based design in healthcare and virtual facility prototyping were studied to find opportunities for developing systems that could improve the current design review process. Observations during a pilot study of an interactive virtual prototype in an immersive virtual environment showed that end users envision tasks they perform in their respective facilities while giving feedback during design reviews (Leicht et al. 2010). A concept emerged of developing interactive virtual prototypes that allow end users to visualize performing tasks while reviewing the space. This concept was termed as the “Experience-based Virtual Prototyping System” or the EVPS. Literature review helped define the research problem by finding gaps in prior research. A review of multiple studies showed that game engines could be effectively used to develop interactive virtual prototypes and possibly embed task-based scenarios. However the studies also show that it is quite cumbersome and time-consuming to develop these virtual prototypes and their impact had not been assessed in detail (Figure 3-2). Based on the literature review it can be summarized that the research problem is regarding the efficient development and subsequent testing of the EVPS. Although interactive virtual prototypes using game engines have been used for design review, there is a lack of streamlined procedures to make development easier. Moreover, because the interactive virtual prototypes are so difficult to develop, it is imperative to know if end users would actually benefit from using task-based scenarios embedded in virtual prototypes during design reviews. These gaps and problems raise pertinent research questions on both the development and impact of the concept of experience-based virtual prototyping system. 1) How can we extract end user scenarios of tasks to embed in virtual prototypes? 2) How can we more effectively develop interactive virtual prototypes with task-based scenarios? 3) How can we use experience-based virtual prototypes (EVPS) in healthcare setting? 4) How can we evaluate effectiveness of experience-based virtual prototypes? Research questions led to formulation of objectives. Each objective was broken down into a set of tasks and sub-tasks that will be discussed in the research steps. The development part of Concept – Development – Impact model dealt with investigating procedures to develop the concept further. This step explored methods and procedures that could take the EVPS concept into the development stage. The first two research questions focus on developing a process to first, understand what tasks should be incorporated in virtual prototypes and second, figure out an effective way to develop the interactive virtual prototypes. Development process enabled that through the study of relevant disciplines for discovering new ideas and approaches. Domains of interest included virtual prototyping, gaming engines, and scenario-based design. Next, processes to rapidly transfer model content from existing applications into an interactive virtual prototyping environment were tested by “prototyping the prototype”. Chapter 4 gives a detailed description of the scenario framework and EVPS development process. Various healthcare-related projects and small case studies were used as test-beds throughout the development process to streamline design information workflows. While the concept EVPS design was part of healthcare facility design, process to embed scenarios in an interactive virtual prototype were tested through a project on independent living facilities for the elder (Kumar et al. 2011). Once an efficient procedure to develop the EVPS concept was defined, it was implemented on a healthcare facility case study to assess the impact. Research questions related to how EVPS can be implemented in a healthcare setting and how it would affect the design review process for end users were studied within the impact phase of the “Concept – Development – Impact” model. Evaluating impact of the developed concept – EVPS was done using a multi-method approach of case study and experimentation. The case study chosen for the evaluation phase was the new Hershey Children’s Hospital (Chapter 5) that was under construction during the study. The EVPS development process was tested on the Hershey Children’s Hospital, by first using focus groups to elicit requirements and then developing interactive virtual prototypes for use by end users of the facility. Evaluation of the use of EVPS was done through observational field study during design review meetings with the pharmacy staff of the hospital. Next, a user study tested the effect of using task-based scenarios embedded in the interactive virtual prototype on end user feedback during design review. The evaluation study is described in detail in Chapter 6. Once the research approach was defined, objectives for the research were broken down into specific research tasks and activities. The following describes specific research activities assigned to accomplish the objectives. Objective 1: Develop a virtual prototyping procedure to extract end user experience of healthcare activities in interactive virtual prototypes. Develop a procedure to document scenarios of activities within the healthcare facility context. Develop a hierarchical data structure for task-based scenarios that characterizes attributes of the interactive objects used and specific tasks performed within these scenarios. Objective 2: Design a framework for structuring end-user activities into scenarios that can be simulated in an interactive virtual prototyping system. Design of overall system architecture for interactive virtual prototyping that defines the components, databases and libraries that will be used for development of the virtual prototyping system within a rendering/ gaming engine. Classify design review requirements along with additional features and functionality that can be added to the virtual prototyping system for interactive design review. Development of an interactive interface to allow the end user to carry out specific task-based scenarios in the virtual environment through scenario definition, scripting and use of interactive objects. 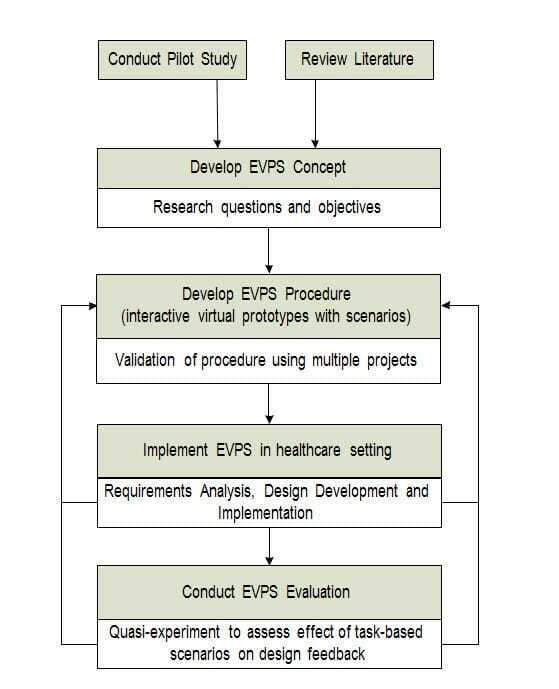 Objective 3: Develop an interactive computing platform titled the Experience-Based Virtual Prototyping System (EVPS) for implementation in healthcare design reviews. Utilize an appropriate programming environment / gaming engine for the development of an interactive virtual prototyping system termed the Experience- based Virtual Prototyping System (EVPS). Investigate design information workflows for importing facility models from various BIM authoring tools (E.g., Autodesk Revit) to the interactive virtual prototyping system. This would include identifying challenges and limitations in the workflow to facilitate rapid conversion of facility models into the virtual prototyping system. Generate reusable interactive virtual content models such as avatars of user roles and objects with dynamic behaviors like wheelchairs that are needed for the development of interactive virtual prototypes. Validate the procedure used to develop and implement task-based scenarios in the interactive virtual prototyping system and review capabilities and limitations of the EVPS against functional requirements. Objective 4: Assess the developed EVPS to evaluate effectiveness of interactive virtual prototyping for enhancing the experience-based design review process of healthcare facilities. Identify a suitable facility within the healthcare context that will benefit from the implementation of an experience-based design review process using interactive virtual prototypes. Investigate and document several specific scenarios of tasks undertaken in healthcare facility. Evaluate the use of the EVPS application for design review of healthcare facility implemented in an immersive virtual environment to assess its effectiveness in collaborative design review and decision making process. Obtain feedback through observations during field study meetings of end users during the design review process. Implement user study to evaluate the effect of using task-based scenarios in interactive virtual prototypes for design review of healthcare facilities by end users. Following Table 3-1 shows research methods adopted for each specific research task. I. Develop a virtual prototyping procedure to extract end user experience of healthcare activities in interactive virtual prototypes. II. Design a framework for structuring end-user activities into scenarios that can be simulated in an interactive virtual prototyping system. III. Develop an interactive computing platform titled the Experience-Based Virtual Prototyping System (EVPS) for implementation in healthcare design reviews. IV. Assess the developed EVPS to evaluate effectiveness of interactive virtual prototyping for enhancing the experience-based design review process of healthcare facilities..
Table 3-1. Research method adopted for each research task. While research methodology refers to the principles and procedures of logical thought processes, which are applied to a scientific investigation, methods concern the techniques that are available for data collection and analysis as well as a summary of methods that are employed in the research project. In this study, the systems development approach was adopted for the EVPS system design. For EVPS implementation, the case study approach was adopted that included data collection through focus groups using concept mapping as a tool for requirements analysis. Finally evaluation adopted field study method for observation of EVPS application and experimentation for EVPS assessment. Data was collected through survey and talk aloud protocol and analyzed using protocol analysis. The following are brief descriptions of the research methods adopted in the research project. The research process outlined in Figure 3-4 is a systems development methodology that includes elements of both social and engineering research approaches. This methodology is adapted from Nunamaker et al. (1991) and adopted to develop the concept of the Experience- based virtual prototyping system (EVPS). Chapter 4 describes the system architecture for EVPS and process for incorporating task-based scenarios in interactive virtual prototypes. [Publisher’s note: The following is a reformatting of what was originally a figure; hence, it is labeled Figure 3-4. Learn about the concepts, framework, and design through system building process. Gain insight about problems and the complexity of the system. Observe the use of the system by case studies and field studies. Evaluate the system by laboratory or field experiments. Figure 3-4. Systems development methodology (Source: Nunamaker et al 1991). Case-study research method is defined as “an empirical inquiry that: (1) investigates a contemporary phenomenon within its real-life context, especially when (2) the boundaries between the phenomenon and the context are not clearly defined (Yin 2003). Within the Construction Engineering and Management (CEM) domain, often approach case studies as mixed-methods projects with both qualitative and quantitative aspects (Taylor et al. 2011). Some of the limitations of case studies are that they may be limited to samples and cannot be generalized and they may lack precision, quantification, objectivity or rigor in execution. According to Taylor et al. (2011), case-study research can be a rigorous research method that can lead to new insights, open up new lines of inquiry, and yield rich theoretical models that can enhance and expand research in the field of AECM. However, they must meet a “burden of proof”, an obligation that can be met in two ways, referred to as “burden of going forward”. Taylor et al. (2011) provide a research strategy checklist to improve the consistency and comprehensiveness of case study research that includes longitudinal data collection, utilizing multiple researchers and/or raters and triangulation. The research study involved multiple researchers during data collection as this reduced bias. The criteria for case study selection included four factors for consideration. They were: 1) the project should be in a healthcare setting, 2) the project should be ongoing (design or construction phase), 3) BIM or digital model of the project facility should be available, and 4) researcher should have access to end-users of the project for data collection and assessment. The Hershey Children’s Hospital was selected as a case study for data collection. The final procedure to develop EVPS was tested using digital models of the new, currently under-construction Children’s Hospital. Chapter 5 discusses the new Hershey Children’s Hospital case study in detail. Focus groups were used as a primary means of data collection for requirements analysis. End users were asked to elicit scenarios of activities they would like to see embedded in the interactive virtual prototypes. The focus group method is an established rigorous technique for collecting interviews aimed at eliciting and exploring in-depth opinions, judgments and evaluations expressed by professionals, experts or users/ clients about specific topics (Morgan 1997). The key difference between one-to-one interviews and focus-group discussions is that the latter is far more appropriate for the generation of new ideas formed within a social context (Breen 2006). During focus group discussions, concept-mapping tool was used to record and validate the scenarios collected and discuss them in more detail. Concept maps are diagrams that are used to represent and convey knowledge (Klein and Hoffman 1993). Concepts maps traditionally use paper and pencil, posters or stick-on notes and are often used in brainstorming sessions. In concept-mapping knowledge elicitation, the researchers help the domain practitioners build up a representation of their domain knowledge, in effect merging the activities of knowledge elicitation and representation. Concept maps help form knowledge models to support knowledge preservation, knowledge sharing and creation of decision support systems (Crandall et al. 2006). This research used concept maps to develop a hierarchical structure that frames scenarios and helps inform model content. Both qualitative and quantitative research approaches were adopted for evaluating the developed EVPS in a healthcare context. The first part of evaluation was done through observational field study (Chapter 5) and the next part was a field experiment (Chapter 6). Both evaluation studies involved end users of the Hershey Children’s Hospital as participants. For first part of analysis, an observational field study was conducted during design review meetings of the new Hershey Children’s Hospital. The pharmacy staff at the hospital utilized the EVPS developed during the case study research for their transition planning review meetings. Interviews and observations from the design review meeting helped inform how end users can apply EVPS during all phases of the facility life cycle. The design review meetings and their findings are described in more detail in the latter half of Chapter 5. A user study was designed using a posttest only control group experiment design where nurse participants were randomly assigned to either the walkthrough only control group or the task-based scenario treatment group. Pretest was used only to get demographic data from the participants. During the user study, participants were video taped as they navigated through their specific assigned stimulus and performed specified tasks based on the condition they were assigned to. A Cognitive Task Analysis approach, talk aloud protocol was employed during the study for knowledge elicitation. Chapter 6 gives a detailed description of the user study design and procedures. Surveys can be divided into two broad categories of questionnaires and interviews. Surveys vary from highly structured questionnaires to open-ended questions (Fellows and Liu 2003). During the user study, posttest questionnaires were administered to ask questions regarding ease of use, design layout, model content and overall experience in using EVPS. Chapter 6 describes the data collection procedure using surveys in detail. Talk Aloud Protocol (TAP) originated in classic research domain within the psychology of problem solving. In studies, research participants are instructed to speak their thoughts as they work on problems and do so as if they are “speaking to themselves” (Ericsson and Simon 1993). TAP helps capture what end users know about their domain: its concepts, principles and events. Participants were encouraged to do task explication. In addition to thinking aloud, participants could also be probed with questions afterward (Van Someren et al. 1994). The approach to analysis of TAP data falls in the middle of the analytic spectrum drawing from both qualitative and quantitative analytic techniques. Data from TAPS consists largely of a record of the participant’s verbalizations. The data recordings – either audio or video has to be transcribed and then coded in some way. The procedure for coding a protocol is referred to as Protocol Analysis (PA). In traditional PA, every statement in protocol is coded according to some sort of a priori scheme that reflects the goal of the research. The coding scheme depends on the task domain and purposes of analysis and begins with indexing common themes and patterns while breaking down data into units. It is often valuable to have more than one coder conduct the protocol coding task. In some cases it is necessary for demonstrating soundness of research method and conclusions drawn from research. For research in which data from TAP task are used to make strong claims about reasoning process, especially reasoning models that assert cause-effect relations among mental operations, the assessment of inter-coder reliability of protocol coding is regarded as a critical aspect of research. This chapter begins with describing the adopted research approach of Systems Development and the rationale for its selection. Next the research steps are listed and the corresponding research methods undertaken to accomplish each research task are described. The next chapter describes the development process and framework for experience-based virtual prototyping system in detail. Teaching pregnant women not to share food with their families. This is the story of an obscure $250 million a year program run by the Department of Agriculture which attempts, among other things, to cure both obesity and underweight in pregnant women by providing the same amounts of food, including commercial junk cereals that are mostly sugar. The Special Supplemental Food Program for Women, Infants and Children (called WIC) is in addition to food stamps and all other social welfare programs. WIC was created by Hubert Humphrey on the floor of the Senate in 1972. It was intended as a two-year experiment. There were no legislative hearings, and the House never even considered the proposal, which at that time weighed in at a mere $20 million per year. Humphrey carried on to the floor of the Senate “before” and “after” photographs of an infant from Memphis who had starved nearly to death and who had probably suffered brain damage as a result. Humphrey introduced an amendment to the school lunch bill which created a pilot program in the Department of Agriculture (for some reason) to see whether it would be a good idea to provide nutritious food to pregnant and lactating women and children up to four years of age. The amendment passed overwhelmingly despite Agricul­ture Department opposition based on the apparent failure of a similar previous effort. The proposal was agreed to in conference without consideration by the House. President Nixon had no choice in an election year but to sign the school lunch bill, and so WIC became law. The program was created, its sponsors will tell you, at the recommendation of th e 1969 White House Conference on Food, Nutrition and Health. Actually, the Conference recommended against programs, like WIC, aimed at special vulnerable groups like infants and pregnant women. In the first year after passage the Agriculture Department, which opposed the program, did nothing to set it up. The department argued that it knew nothing about maternal and child health care and that the program really belonged in HEW. After a year the administration announced its intention to save the taxpayers $34 million by spending six million dollars on a study instead of $40 million over two years. This produced a law suit by a public interest group called the Food Research and Action Center (FRAC) . Judge Oliver Gasch of the US District Court for the District of Columbia found that Congress had not intended to find out whether feeding people was a good idea. Congress had intended to spend the money feeding as many people as possible. Agriculture officials frantically ran around the country, in the words of one observer, “handing out dollars.” Just as Judge Gasch was about to declare the department in contempt of court, USDA announced that 143 clinics were to be funded. In January 1974, the first recipients received WIC food. To be eligible for WIC food, a physician or “health professional” must certify that you are “a nutritional risk.” The law lists certain medical conditions: obesity, underweight, stunting, anemia which the free food is in tended to help . But it also allows “low-income” to be used as a determination of “nutritional risk.” The idea, a sensible one, is that if you are pregnant or an infant and you can ‘t afford to eat properly, then you are at risk of being in bad health. Despite stringent federal regulations about who qualifies for food, practices vary widely among the local health clinics. In some everyone who walks in the door, regardless of income or medical condition receives the food. In others a poor person must prove she or he has a qualifying medical condition in order to obtain a “package containing infant formula, orange juice, Kaboom cereal, etc. By October 1975 the Democratic Congress­ overriding President Ford ‘s veto increased the WIC funding to $250 million per year. It was no longer a temporary program. A subsequent lawsuit over delays and failure to appropriate funds resulted in an order by Judge Gasch that in effect forces the Agriculture Department to share administration of the program with the federal courts. Four times a year until September 30, 1978 (when the current funding expires), Agriculture officials must report to Judge Gasch about what they’ve been doing and how much money they have been spending. Attempts to evaluate the program or even to define its purpose are hopelessly difficult. The Agriculture Department does not even have a list of the local programs it funds or how many people receive benefits. Since qualifying for the program requires a health examination, many who live in areas of high poverty and high infant and maternal mortality rates are ineligible for benefits because of the absence of medical care. WIC pays for food, the administrative cost of distributing the food and nutritional education to teach recipients how to use i t. There i s a pretense that the amount of food provided is tailored to the nutritional requirements of the individual, but in practice most clinics, for administrative reasons, provide the maximum quantity permitted . There is no rationale for the size of the food package. An obese child of four receives the sa me quantity of food as a underweight pregnant girl of 14. Infants under six months of age, for example, receive infant formula , juice and cereal far in excess of their recommended daily requirements. Local administrators oppose any reduction in the size of the package on the grounds that families share what is provided. A stud y by the Urban Institute found that even though it is prohibited, 81 percent of recipients admitted that they share the food with their families. To make sharing easier, nutritionists provide recipes using infant formula to make fudge and chicken broth. The quality of nutritional education is often poor. It frequently consists of exhortations to a pregnant woman not to share her omelet with her family . Probably the saddest thing about this program is that it serves a real need. Many who would not otherwise receive prenatal examinations or inoculations for disease are lured into health clinics by the desire for free food. For many of the program’s 785,000 participants, the $22 worth of food a month represents a badly needed income supplement. Against the will of its creators and national administrators, the WIC program has become another general welfare program for feeding the hungry, and we still don ‘t know how many of our citizens are hungry . Joel Solkoff is a Washington writer specializing in food issues. Published by The New Republic June 11, 1977. Copyright 2013 by Joel Solkoff. All rights reserved. Note 2: The WIC program costs $7 billion a year. The Conference Committee ironing out the differences between the House and Senate versions of the Farm Bill has agreed to a compromise which will leave the WIC program essentially in tact. How much in tact remains to be seen, but I am reliably informed that WIC will continue to be with us. Note: 3: “WIC. The WIC Program helps improve the health and nutritional intake of low-income pregnant, breast-feeding and postpartum women, infants and children up to their fifth birthday. WIC serves over half of all babies in the United States. WIC works by providing participants with vouchers redeemable at retail grocery stores for foods dense in nutrients known to be lacking in the diets of eligible groups and by providing nutrition education, breastfeeding counseling and referrals to other important health and social services. This chapter evaluates the current state of literature and identifies gaps to inform areas for further research. The role of virtual prototyping in design reviews of healthcare facilities is determined by exploring three broad topics of a) design reviews as a process that take place within b) the context of healthcare facility design and finally through the use of c) virtual prototypes as a tool as shown in Figure 2.1. Literature sources reviewed are primarily from the AEC domain that comprises virtual prototyping theories and design theories including healthcare design. The first two sections of this chapter introduce design review concepts in the healthcare field. The third section focuses on virtual facility prototyping as an effective tool for experience- based design review with end-users. This section describes how virtual prototyping allows for better visualization of facilities through case studies of successful implementation both within and outside the healthcare context. Finally, it identifies the potential for engaging design reviewers by incorporating greater interactive experiences in the virtual facilities. Based on the above findings, the final section explores the possibility of portraying virtual prototyping through game environments to enable interactive review of virtual healthcare facilities. Design is the process by which the needs, wishes, and desires of the owner are defined, quantified, qualified, and communicated to the builder. As such, it is the particular phase of the project where many key decisions are made (Sanvido and Norton 1994). The traditional approach to the planning, design, construction and operation of a facility in the AEC industry favors a sequential, “over the wall” approach to project development where many participants often work independently while taking decisions that may affect others. Decision-making during design reviews are usually dominated by the perceptions of the “expert” decision makers (E.g., planners, architects, and design engineers) and focus mainly on the technical elements of a project (Isaacs et al. 2011). According to Anumba et al. (1997), this often leads to inadequate capture, analysis and prioritization of client requirements, lack of communication of design intent and rationale as well as poor integration, co-ordination and collaboration between the functional disciplines involved in the project. 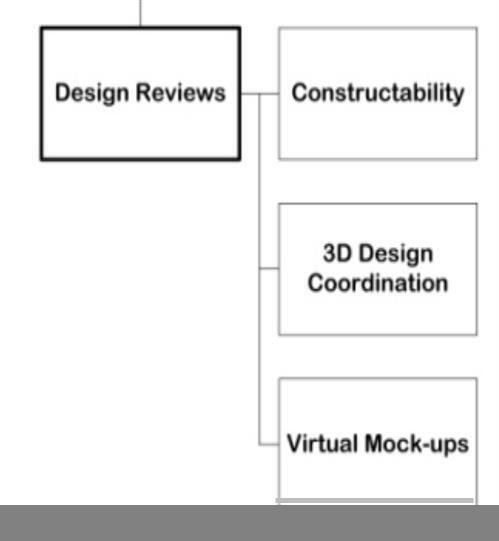 Design Review is defined as a process in which design is reviewed for constructability, coordination of systems and visualization of spaces and building details (Computer Integrated Construction Research Group 2010). The Design Review Process usually occurs during the design phase of the facility life cycle. The design process is traditionally broken into the following phases of programming, schematic design, design development and construction documents (Figure 2-2). Design review is usually done between participants that include the Architecture, Engineering and Construction (AEC) team and the clients or end-users of the facility. The purpose of design review is to evaluate the proposed design of the facility against the programmatic requirements and needs of the client. Kagioglou et al. (2000) employ a “stage gate” approach for design review that applies a consistent planning and review procedure throughout the process covering the whole ‘life’ of a facility project from recognition of a need to the operation of the finished facility and, finally, to its demolition. They propose the Generic Design and Construction Process Protocol (GDCPP) which divides the project into four major phases: 1) Pre-Project Phases comprising of demonstrating the need, conception of need, outline feasibility, substantive feasibility study and outline financial authority; 2) Pre-Construction Phases including outline conceptual design, full conceptual design, and coordinated design procurement and full financial authority; 3) Construction Phases that include production information and construction; and finally 4) Post- Construction Phase comprising of operations and maintenance. Each of the above phases require a review from project stakeholders (Kagioglou et al. 2000). Communication of design information is of vital importance in the facility design process as each building project involves the collaboration of several disciplines and project stakeholders. Traditional design information communication took the form of two-dimensional (2D) drawings, with designers using plans, elevations and perspectives to represent their design intent. Along with the emerging new media and the rapid changes of information technology, digital design has become a leading trend, and design thinking in the digital world has changed accordingly. Representation applied in the digital design world has been modified to meet the different design situations. The newly emerged virtual environments, with the advantages of visualizing the virtual world through perception, have created different dimensions of representation for design. Thus, the representation and perception are two important human cognitive faculties involved with design in virtual environments (Chan 2011). 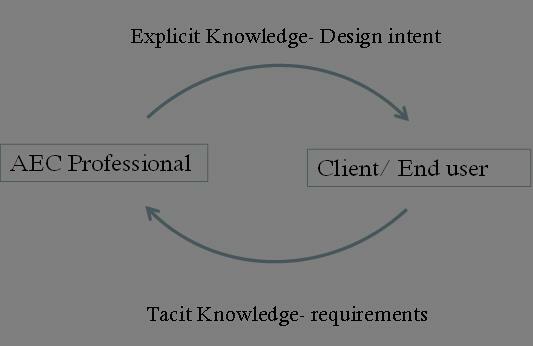 Based on the studies, Figure 2-3 shows a conceptual model of design communication between AEC professionals/ project team and client/end-user. While the AEC professionals use media to represent design intent, end-users are expected to perceive the design from the media to engage with design, and provide design review feedback. In design, designers use suitable means to mentally create design concepts, apply communication channels (media) to express their design concepts and turn the concepts into external visible artifacts (products); so that designers and other viewers (or clients) can visualize the design in progress. These various means used for creation are internal representations, whereas the artifacts are external representations of the design. The entire design process phenomenon consists of representation of design concepts and utilization of appropriate media to make the concepts visible until the final solution is reached. These complicated mental processes usually generate some external representation of a drawing, video, physical model, digital model, virtual model; or the combination of all (Kalay 2004). (2) participant discussions, and (3) achieving the objectives of information transfer in different phases of the planning process (Chan 2011). Architectural design progresses through different stages where representations take different forms depending on the level of information that needs to be communicated. Thus, the nature of design representation varies from more abstract forms in the conceptual stage to become more detailed and more realistic as design evolves. There are five categories of design communication media are used. These include the pencil-and-paper– usually abstract drawings, quick sketches, or even construction (or working) drawings, physical models that depict scaled down 3D representation for study; digital models- developed using computer software; film and video- create animation for demonstrating design concepts; and lastly, Virtual Reality (VR) -advanced media for visualization and simulation of design (Chan 2011). Figure 2-4 shows two categories of physical (top) and digital (bottom) design visualization media used in AEC domain. From left to right, these visualization media are arranged from the level of lowest (abstraction) to highest (realism) fidelity. Traditionally, two-dimensional floor plans of buildings and elevations or perspective projections have been the basic communication media between architects and their clients. Particularly with respect to the interior of buildings, architects relied on the client’s imagination to visualize a proposed building from its architectural plan views, assuming that clients are familiar with architectural symbols, and have training and experience to construct three dimensional images from two dimensional plan views (Funkhouser et al. 1996). Clients and architects often discuss design proposals by studying the scaled models through the overhead perspective that forces the viewers to imagine themselves looking and moving within the model which can lead to misperceptions. Full-scale models known as mock-ups, allow viewers to experience an artifact as close to reality as one can come without constructing the facility itself. Physical mock-ups at full-scale are essential for verification of constructability and functional performance especially for complex façade assembly (Pietroforte et al. 2012) or more costly unique construction such as operating rooms. Building Information Modeling (BIM) is a process that provides a means for owners, designers, contractors, and operators to generate, organize and use detailed information throughout a project lifecycle. Over the past several years, BIM implementation has increased substantially within the AEC Industry. The National BIM Standards (NBIMS) Committee defines BIM as: “… a digital representation of physical and functional characteristics of a facility. A BIM is a shared knowledge resource for information about a facility forming a reliable basis for decisions during its lifecycle from earliest conception to demolition. A basic premise of BIM is collaboration by different stakeholders at different phases of the life cycle of a facility to insert, extract, update or modify information in the BIM to support and reflect the roles of that stakeholder. The BIM is a shared digital representation founded on open standards for interoperability” (buildingSMART alliance 2007). The Computer Integrated Construction (CIC) Research Group at Penn State has developed a BIM Project Execution Plan that describes an execution strategy to implement BIM on a project which comprises of the following four steps: 1) Identify BIM Goals and Uses; 2) Design the BIM Project Execution Process; 3) Develop Information Exchanges; and 4) Define Supporting Infrastructure for BIM Implementation (Computer Integrated Construction Research Group 2010). Of the 25 BIM uses defined by the BIM Project Execution Planning Guide, design reviews ranked second in both the frequency of use and perceived benefit of use by AEC organizations (Kreider et al. 2010). The Building Information Modeling (BIM) use for “design review” can employ either some computer software or advanced virtual environment facilities, such as CAVE (Computer Assisted Virtual Environment) and immersive screens. Further, the virtual mock-ups (prototypes) can be performed at various levels of detail depending on project needs. Successful construction projects are designed, built and equipped to meet users’ needs. Whether it concerns the function and expression of an entire building or the design of a single space, users hold a unique knowledge, which should be integrated properly in the design to ensure a successful building project. Designers engage in conversations with clients and users at various stages of the design process, in part to make sense of the information gathered and then to make decisions and generate ideas for the design of the space. Aesthetic and functional design decisions are made on the spot by designers engaged with stakeholders as they define how the space should be occupied and for what purposes (Poldma 2010). There is a service relationship that develops between the designers and users as they participate together in both design and production processes (Tzortzopoulos et al. 2006). End-users are defined as those who use/occupy the building; they are not experts in managing it, but have knowledge and opinions, nonetheless, about its performance in relation to their own objectives. The end-users of a building are typically building inhabitants, external service providers, operation and maintenance personnel, and building administration. They may have conflicting wishes and expectations on building performance in many cases. Building end-users are a source of experience and expertise that can be brought into the briefing stage for the evaluation of design proposals. End-users are often a source of new ideas promoting innovation (Carvajal 2005). In creative collaboration such as design, teams are formed to find a novel solution to the problem. They are required to have shared understanding and joint decision-making skills (Kalay 2004). According to Akin (1986), the design process needs to be decomposed explicitly into smaller phases to make possible the contributions of a large number of participants, such as engineers, planners, and clients or user groups. Since the integration of each participant in this complex process is essential, these interest groups can participate in design meaningfully if they are informed about the relevant decisions and alternatives during the course of the design process. Furthermore, experts from diverse fields may be responsible for parts of the design, and they need to be able to communicate their ideas to other people in the design team (Schön 1991). The design process can, in itself, become a common artifact, around which communication takes place (Davies 2004). Drawings are still predominantly used in design and engineering, though computers have been adopted in the last fifteen years to support design and drafting mostly in 2D. 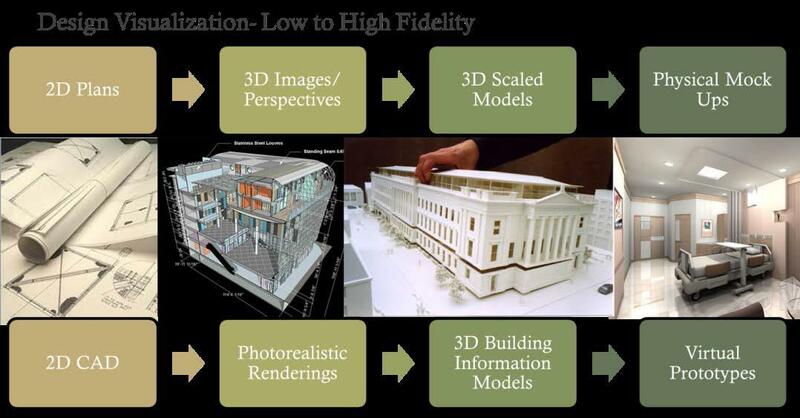 BIM is making an enormous shift in approach to design since it is replacing 2D drawings with 3D models. 3D visualization is one of the most important aspects of the design optimization because it improves communication with all stakeholders and speeds up design decisions (Zikic 2009). Participatory design is an advantageous approach when the tacit knowledge invested in the people who work day-to-day in a particular situation must be captured (Davies 2004). Since, users evaluate the built environment differently from designers (Zimmerman and Martin 2001), participatory design approaches attempt to bridge a gap in understanding between users and designers. This can be extremely useful in understanding the tasks performed by healthcare practitioners by incorporating their knowledge of how things work in their setting into the virtual environment. Furthermore, when large changes are to take place in a work situation, involving the people who are to work in the new environment in the design process increases the acceptance of those changes. User-centered design (UCD) is an approach to design that grounds the process in information about the people who will use the product. UCD processes focus on users through the planning, design and development of a product. This concept is derived from the domain of information sciences and technology and Human Computer Interaction (HCI) theories, specifically Human Centered Design Processes that provides guidance for the design and development of computer systems. Users are typically experts in some domain of activity relevant to the product being (facility) being designed (Erickson 1995). Many studies suggest strong links between the physical environment to patient and staff outcomes in the following areas: Reducing staff stress and fatigue and increasing effectiveness in delivering care; improving patient safety; reducing patient stress and improving outcomes; and finally improving overall healthcare quality (Ulrich et al. 2004). Therefore, there is a need for innovative approaches to design such as Experience-based Design (EBD) that focuses on end- user and staff experiences in a facility to identify creative design solutions. Hospitals are the most complex of building types. Each hospital is comprised of a wide range of services and functional units. These include diagnostic and treatment functions, such as clinical laboratories, imaging, emergency rooms, and surgery; hospitality functions, such as food service and housekeeping; and the fundamental inpatient care or bed-related function (Carr 2009). In addition to the wide range of services that must be accommodated, hospitals must serve and support many different users and stakeholders. Ideally, the design process incorporates direct input from the owner and from key hospital staff early on in the process. The designer also has to be an advocate for the patients, visitors, support staff, volunteers, and suppliers who do not generally have direct input into the design. Good hospital design integrates functional requirements with the human needs of its varied users with the planning process. The design of healthcare facilities is governed by many regulations and technical requirements. Healthcare facilities encompass a wide range of types, from small and relatively simple medical clinics to large, complex, and costly, teaching and research hospitals (Carr 2009). Healthcare facilities have to be specially designed to fulfill the needs of medical care and maximizing the efficiency of the whole medical system; it is also crucial to plan all spaces well so it will minimize the travelling of patient within the facilities; to maximize the efficiency of the integration of each related facilities. It is always a challenge for architects to design healthcare facilities; the knowledge of medical care and the medical systems is essential to begin. It is estimated that $100 billion in inflation-adjusted dollars has been spent on new healthcare construction in the past 5 years and $250 billion will be spent in the next 10 years (Clancy 2008). The entire healthcare system is under great pressure to reduce costs, and at the same time, be more responsive to “customers”. This can be challenging as the design of the healthcare facility has to address the human needs of each of the defined user groups which includes patients, caregivers, employees, visitors as well as the community. Healthcare facilities not only require specialized and complex functions to be performed in them, but they must also address the needs of the end-users such as the patients, staff and healthcare practitioners using the facility. This makes them exceedingly difficult to design, build and operate due to the incorporation of the interdisciplinary knowledge and input of various stakeholders such as the design professionals, engineers, facility managers as well as the end- users (patients, staff and medical professionals) of the building. Hence, there is a need to create innovative tools and procedures that facilitate high levels of participatory design and allow better visualization of these complex facilities to aid in the decision-making process during the planning and design of these specialized facilities. The Center for Health design (CHD) was formed as an organization in 1993 with the express intention to serve as a consortium for knowledge in many different fields that contribute to the creation of healing environments for both patients and staff. (Center for Health Design 2010). Evidence-based design has evolved from other disciplines that have used evidence-based model to guide decisions and practices in their respective fields. Evidence-based design has evolved from other disciplines that have used evidence-based model to guide decisions and practices in their respective fields. Evidence-based design is used to persuade decision-makers to invest the time and money to build better hospital buildings that are based on current research so they can realize specific advantages (Stankos 2007). Experience-based design is defined as a user-focused design process with the goal of making user experience accessible to the designers, to allow them to conceive of designing experiences rather than designing services (Bate and Robert 2006). 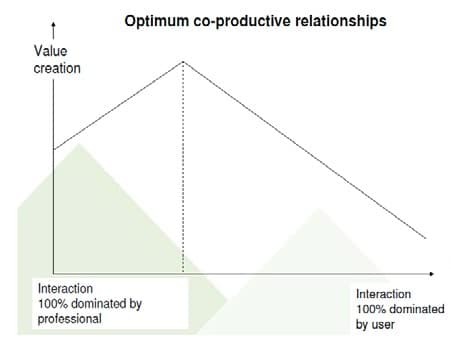 Figure 2-6 shows co- productive relationship between designers and users to create optimum value in the healthcare facility design. Figure 2-6. Co-productive relationship between designers and users in EBD. (Source: NHS 2008). Using experience to design better healthcare is unique in the way that it focuses on capturing and understanding patients’, careers’ and staff experience at crucial points in the care pathway. NHS website: what’s special about using experience to design better healthcare is its focus on capturing and understanding patients’, care givers’ and staffs’ experience of services and not just their views of the process like the speed and efficiency at which they travel through the system. The term has emerged from the UK’s National Health Services’ (NHS) Institute for Innovation and Improvement. According to Bate and Robert (2007), Experience in Experience- based design (EBD) is designated, as “how well people understand it, how they feel about it while they are using it, how well it serves its purpose, and how well it fits into the context in which they are using it.” By identifying the key moments and places, where people come into contact with the service and where their subjective experience is shaped, and therefore where the desired emotional and sensory connection needs to be established—and working with the front-line people who bring alive those various touch points in the journey—it is possible to begin designing experiences rather than processes. The task for experience-based design is to gain access to that knowledge and use it in the service of a better design and a better experience for the user. Design evolves, ideally, through an iterative process of prototyping, involving actual users, designers, engineers, and other experts until a satisfactory result has been achieved (Norman 1988) and can be used for “facilitating meaningful innovation” from a combination of “understanding what people do and think” and “innovative technology” (Rheinfrank et al. 1994). “Prototypes” are representations of design ideas created before final artifacts exist. In some industries or companies, the term prototype is reserved for highly resolved and close-to- launch versions that in essence “stand for” a final product or offering (Coughlan et al. 2007). Prototyping, which is the process of developing prototypes, is an integral part of iterative user-centered design because it enables designers to try out their ideas with users and to gather feedback. Prototyping as a process involves moving from the world of abstract ideas, analysis, theories, plans, and specifications to the world of concrete, tangible, and experiential things (Rudd et al. 1996). In the human-computer interaction context, the main purpose of prototyping is to involve the users in testing design ideas and get their feedback in the early stage of development, thus to reduce the time and cost. It provides an efficient and effective way to refine and optimize interfaces through discussion, exploration, testing and iterative revision. Early evaluation can be based on faster and cheaper prototypes before the start of a full-scale implementation. The prototypes can be changed many times until a better understanding of the user interface design has been achieved with the joint efforts of both the designers and the users (Rosson 2002; Rudd et al. 1996). Prototyping can be divided into low-fidelity prototyping, medium-fidelity prototyping and high-fidelity prototyping. The determining factor in prototype fidelity is the degree to which the prototype accurately represents the appearance and interaction of the product. Low-fidelity prototypes are quickly constructed to depict concepts, design alternatives, and screen layouts, rather than to model the user interaction with a system. Low-fidelity prototypes provide limited or no functionality. In contrast, high-fidelity prototypes are fully interactive, simulating much of the functionality in the final product. Users can operate on the prototype, or even perform some real tasks with it (Rosson 2002). In our (AEC domain) use of the term, and more typically within the design profession, prototypes can be usefully thought of as “design representation/ communication tools” and consequently may exist at any level of resolution—from very rough to highly refined—and may be used at any stage in the design process to explore, evolve, and/or communicate ideas (Coughlan et al. 2007). Virtual prototyping is defined as “The process of using a virtual prototype in lieu of a physical prototype, for test and evaluation of specific characteristics of a candidate design” (Schaaf and Thompson 1997). Markham (1998) identified three factors contributing to effective visualization using virtual prototyping: 1) immersion, 2) interaction, and 3) engagement. These factors provide many advantages of using virtual prototyping for design reviews in the AEC field. With the recent advances in technology, many cases of using virtual prototypes during the facility life cycle have emerged in the Architectural Engineering and Construction industry. The use of Virtual prototyping in the building industry began in the nineties and build up in the last ten years (Whyte 2003). Some of the earlier applications of virtual prototyping used expensive immersive virtual prototyping environments such as CAVEs (Cruz-Neira 1998) or described the use of custom-based virtual reality suites that enabled real-time visualization of building models (Funkhouser et al. 1996). Table 2-1 shows a list of studies that have applied virtual prototyping in the AEC context either to assess their effectiveness for design review, or to develop tools and technology required for virtual prototyping. For each study, Table 2-1 lists the year, authors, facility type, and the type of virtual reality (VR) system/ software and VR technology/ hardware used. Although the following list of studies is not comprehensive, the table shows shifts in trends of using more off- the-shelf real-time rendering/ gaming engines, digital 3D file formats like VRML and virtual reality plug-ins from previous use of highly customized VR suites. The studies that are in bold, relate to use of virtual prototyping in healthcare facilities. Table 2-1. List of studies that used Virtual Prototyping for Design Review. For each study, Table 2-1 lists the year, authors, facility type, and the type of virtual reality (VR) system/ software and VR technology/ hardware used. Although the following list of studies is not comprehensive, the table shows shifts in trends of using more off-the-shelf real-time rendering/ gaming engines, digital 3D file formats like VRML and virtual reality plug-ins from previous use of highly customized VR suites. The studies that are in bold, relate to use of virtual prototyping in healthcare facilities. Recently, apart from applying virtual prototyping for design and constructability review, studies have also explored issues related to construction safety processes (Lin et al. 2011). These studies use virtual prototyping to visualize the construction process for hazard identification in the early phases of design (Chun et al. 2012). The next section focuses on the use of virtual prototyping specifically in healthcare facilities. Virtual Prototypes can be extremely useful in understanding the tasks performed by healthcare practitioners by incorporating their knowledge of how things work in their setting into the virtual environment. 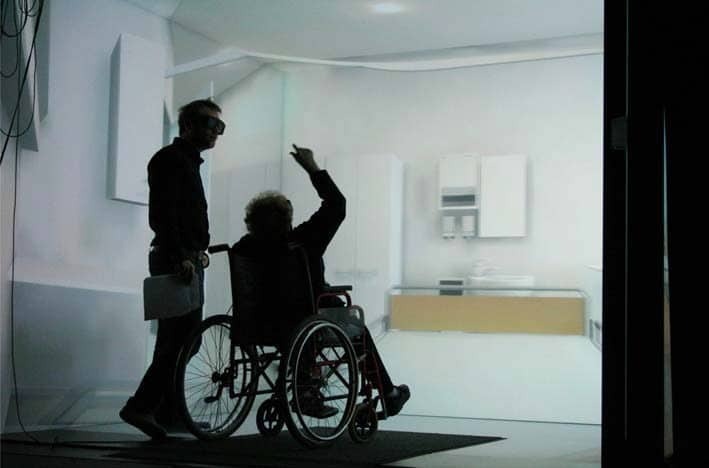 For large complex projects such as hospitals and healthcare facilities, virtual prototypes can be used to tailor environments to user needs (Whyte 2002). Furthermore, when large changes are to take place in a work situation, involving the people who would work in the new environment in the design process increases the acceptance of those changes (Davies 2004). Healthcare facilities can benefit significantly through the application of virtual prototyping in the design process as it enables the evaluation of a range of essential criteria. These could include but not be limited to evaluating mobility of equipment and furnishings; dimensions and placement of doors, windows and cabinetry; accommodation of flow into, out of, and within the room; accessibility and safety of bathroom facilities; assessment of noise levels filtering from outside the patient room; identification of architectural features for infection control; and intensity of various light sources. Figure 2-8 shows a patient room display in a virtual reality CAVE (Dunston et al. 2007). Figure 2-7. Patient room display in a virtual reality CAVE system. (Source: Dunston et al. 2007). A study by Whalström et al. (2009) employed an immersive CAVE system to examine how end-users perceive use of virtual environments to analyze patient rooms (Figure 2-9). The study showed that virtual prototyping was convenient for evaluating most issues identified by the study participants in the actual hospital wards. Participants of the study included both nurses and patients who assessed a range of issues including aesthetics, correct location of equipment, supplies and materials, window/ door positions and the living/workspace size. Participants also identified that it was not possible to evaluate certain healthcare facilities features in virtual environments such as temperature, air circulation and noise. Some other limitations highlighted were the inability to touch modeled objects as well as accurately evaluating lighting levels. Figure 2-8. Patient interview within an immersive virtual environment. (Source: Whalström et al 2009). According to Schrage (2000), prototypes can foster collaborative creativity by externalizing thought and sparking conversations to make knowledge more explicit. Virtual prototypes can be effective tools to extract tacit knowledge of the end-user during the design process, thereby enhancing creativity. User involvement can take a variety of forms, from appraisal of an expertly modeled and animated 3-D virtual model with ensuing discussion to active design using virtual prototypes as a design tool. The advantages of having user involvement and engagement with the virtual prototypes is that it leads non-AEC professionals to understand the design intent and imagine consequences of the design on their workplace, hence making them committed to the decision making process (Mobach 2008). Moreover, designs can be worked on over a long period of time and discussed among a larger group than is possible in traditional design situations (Davies 2004). Virtual prototypes can provide a degree of functionality as they can allow further degrees of interactivity including multiple viewpoints, the ability to zoom in and out, and the ability to selectively view components. It has also been noted that virtual prototyping and 3D modeling is a means of rapidly developing designs (Gopinath 2004; Schaaf and Thompson 1997). This ability to rapidly develop and modify designs makes the use of virtual prototyping more alluring. Virtual prototyping effectively communicates the design intent to the owner, construction team and end-users to get instant feedbacks on whether design meets program requirements, owner’s needs and building or space aesthetics aspirations (Leicht et al. 2010). 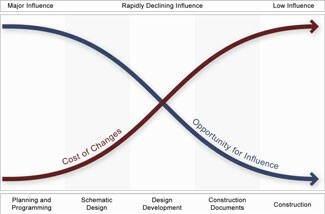 These opportunities for early feedback increase coordination and communication between different parties which is more likely to generate better decisions for design, thereby reducing cost of changes and increasing scope of influence in design as shown in Paulson’s (1976) cost influence curve in Figure 2-10. Figure 2-9. Cost Influence Curve. (Source: Paulson 1976). Studies have also shown that use of virtual prototypes for design review can eliminate costly and timely traditional construction mock-ups (Majumdar et al. 2007, Messner et al. 2007, Leicht et al. 2010). Different design options and alternatives may be easily modeled and changed in real-time during design review base on end-users and/or owner feedbacks (Gopinath 2004) that helps create shorter and more efficient design review cycles. Additionally virtual prototypes can evaluate if the design meets building program criteria and owner’s needs that enhance the health, safety and welfare performance of their projects. For instance, virtual prototypes of BIMs can be used to analyze and compare fire-rated egress enclosures, sprinkler system designs, and alternate stair layouts (Yan et al. 2011). Based on the literature reviewed, it can be inferred that virtual prototyping enhances the design review process by engaging end-users to interact with the facility during design reviews. In pilot studies conducted where virtual facility prototypes were used for design review of a medical pharmacy (Leicht et al. 2010), it was observed that project teams, especially end-users would frequently envision tasks that they would perform within the space they reviewed. This phenomenon triggered the idea of incorporating greater level of interactivity within virtual prototypes such that it allows end-users to move objects and navigate through spaces to simulate typical activities they perform while virtually reviewing the designed space. Project team members could also perform these tasks collaboratively with end-users to possibly identify creative design solutions. The current research literature lacks a defined framework and methodology to make the virtual prototyping process more efficient for developers, while also engaging healthcare end users in the design review process. The ability to virtually perform tasks and interactively review designs requires the development of an experience-based design system combined with interactive virtual prototyping that facilitates collaboration between design disciplines and enables experience- based design with end-user feedback. The concept of Experience-based Virtual Prototyping System (EVPS) can be a combination of experience-based design involving end-users in the design review and interactive virtual prototyping. To realize these complex interactive virtual prototypes with end-user activities, it is important to develop and evaluate a virtual prototyping procedure for their efficient and rapid development. Literature indicates that real-time rendering engines and gaming environments could potentially be used to develop these interactive virtual prototypes that engage end-users through interactive simulations scenarios of activities. However, at present there is only an insignificant relationship between game engines and standard architectural or design visualization tools as they seldom offer real-time rendering and simulations that game engines do. Therefore, to employ gaming environments in interactive virtual prototype development, it is important to study 1) games engine development, and 2) theories related to scenario-based design. Game engines are the core software component that provide the underlying technology, simplify development, and incorporate all the elements vital in a game like physics, collision detection, graphical user interface (GUI), artificial intelligence, network functionality, sound and event engine (Eberly 2007; Fritsch and Kada 2004). Most game engines have a built-in physics engine that supports basic physics, collision detection, rigid body and vehicle physics. Gaming consists of “interaction among players placed in a prescribed setting and constrained by a set of rules and procedures” (Hsu 1989). Contemporary developments in gaming, particularly interactive stories, digital authoring tools, and collaborative worlds, suggest powerful new opportunities for educational media. While gaming environments and simulations are becoming more and more widespread in education, very little is known about how they work (Squire 2006). Similarly, in the design context, unlike reviewing virtual prototypes of facilities in virtual environments, gaming environments can offer extensive possibilities to engage end-users through interactive simulations of task scenarios within the virtual prototype. However, in order to employ gaming environments in the design review of virtual prototypes, it is important to understand how games and simulations can be developed. Furthermore, game engines allow multiple simultaneous users to explore the designed environment (Shiratuddin et al. 2004; Wang 2002) opening possibilities for collaborative design reviews. To truly experience the tasks that are performed in healthcare facilities, the tasks can be simulated as scenarios within virtual prototypes. In the gaming world, the core of Massively Multiplayer Online Role-Playing Games (MMORPG) revolves around completing quests or a series of clearly outlined tasks that are given to the player to complete for in-game rewards (Karlsen 2008; G. Smith et al. 2011). In the context of experience-based design simulations, specific healthcare tasks can be categorized as scenarios that are movement, task, or inquiry based. The scenarios can vary depending on the user, the type of task being performed and the issues it addresses. For instance a movement-based scenario could involve a nurse moving the patient from the Emergency Department (ED) to the patient room. Large–scale healthcare facilities could benefit through simulation of such scenarios as it could help address issues of way finding in large spaces and also check if there are adequate architectural clearances to move equipment, wheelchairs and patients beds through all the corridors of the facility. Similarly scenarios for design professionals of the healthcare facilities could pertain to spatially reorganizing the architectural model in the virtual environment and evaluating different design options. Scenarios are a narrative description of what people do and experience and can be couched at many different levels of description and many grains of detail (Carroll 1995). They are defined as “concrete description of activity that the user engages in when performing a specific task, a description sufficiently detailed so that design implications can be inferred and reasoned about” (Carroll 2003). Scenarios have been gaining immense popularity in designing systems for both human- computer interaction (HCI) and software engineering (Kuutti 1995). However, these scenarios can also be instrumental in designing specialized facilities such as healthcare by extracting specific end-user knowledge. Scenarios can provide insights into how end-users of healthcare facilities behave in their environments and the type of specialized tasks they perform in them. Scenarios simulated in a virtual prototype would help designers and users of healthcare facilities envision the outcomes of design. Hence, scenarios can further open possibilities for new and innovative alternatives for both the way facilities are designed and the way tasks are performed in them. The application of scenario-based design in architectural design review feedback can be viewed as part of the overarching design rationale theory within the HCI domain. Theory of design rationale couples theoretical concepts and methods with the designed artifacts that instantiate them (Carroll 2003). The EVPS concept development is an example of the theory- based design that demonstrates role that models and theories can play in invention, development and evaluation of new technology. This chapter provided an overview of the literature related to design reviews, emerging healthcare design theories like experience-based design, virtual prototyping and its application in the AEC domain, and finally potential use of game engines to develop interactive virtual prototypes. Based on the literature reviewed, the EVPS concept was introduced, which combined theories of scenario-based design, virtual prototyping and healthcare design reviews. The literature review indicates that developing the EVPS would enhance the design review with end- users of healthcare facilities. The next chapter on research methodology lays down the steps and research methodology adopted to design, develop, implement and assess the EVPS. nent that provide the underlying technology, simplify development, and incorporate all the elements vital in a game like physics, collision detection, graphical user interface (GUI), artificial intelligence, network functionality, sound and event engine (Eberly 2007; Fritsch and Kada 2004). Most game engines have a built-in physics engine that supports basic physics, collision detection, rigid body and vehicle physics. Note: Under construction link to Chapter 3. Communication with relatives and friends is more difficult. Being part of mainstream society is DENIED. To get an understanding of the relevance of Wheeler’s ground breaking speech on the implications of excluding large numbers of people, especially, individuals in rural areas and the disabled and elderly, there are two Giants who come to mind instantly. 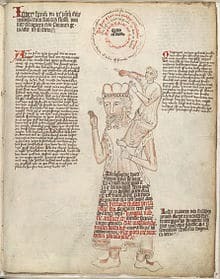 By giants, I refer to the phrase: “Dwarfs standing on the shoulders of giants (Latin: nanos gigantum humeris insidentes) is a Western metaphor with a contemporary interpretation meaning “one who discovers by building on previous discoveries”. 1. Marshall McLuhan and 2. Newton Minnow. “Marshall McLuhan, (July 21, 1911 – December 31, 1980) was a Canadian philosopher of communication theory. His work is viewed as one of the cornerstones of the study of media theory, as well as having practical applications in the advertising and television industries. It is widely believed that John Kennedy became President by one of the narrowest margins in history because of his TELEVISION appearance in the 1960 Kennedy / Nixon debates described above. By 1968 (it is well documented) then candidate for President again Richard Nixon read Marschall McLuhan’s work very carefully. His top campaign advisors were sending memos back and forth with large excerpts from McLuhan’s Understanding Media, a very difficult book to read. McLuhan had observed that people listening to the debate on the radio thought Nixon had won. I listened to the debate on radio and I thought Nixon had won. These debates marked a profound shift in the influence television has on our society. “Minow campaigned for President John F. Kennedy prior to the 1960 presidential election,” notes Wikipedia. “In 1961 he was appointed by President Kennedy to be one of seven commissioners of the Federal Communications Commission (FCC) as well as its Chair. “Thereafter, it came as little surprise that after the election Minow eagerly pursued the position of FCC Chair. …Reportedly, Robert F. Kennedy, brother of John F. Kennedy, and Minow frequently talked at length about the increasing importance of television in the lives of their children during the Kennedy presidential campaign. “ Excerpt from Minnow’s Wasteland speech:When television is good, nothing — not the theater, not the magazines or newspapers — nothing is better. But when television is bad, nothing is worse. I invite each of you to sit down in front of your television set when your station goes on the air and stay there for a day without a book, without a magazine, without a newspaper, without a profit and loss sheet or a rating book to distract you. Keep your eyes glued to that set until the station signs off. I can assure you that what you will observe is a vast wasteland. Here President Obama announces the appointment of Wheeler to head the Federal Communications Commission. As I write here in Rust Belt Pennsylvania in the center of the state of Pennsylvania, Internet service is limited to pockets of miles and miles of area where one cannot make a cell call because the infrastructure is not in place, let alone find one’s way to a Google prompt. ++++ What follows is the heart of Wheeler’s groundbreaking speech. As someone who works in the architecture, engineering and construction community, I am especially interested in the effect access to broadband will have as the Baby Boom generation, as the largest generation in history retires and relocates. Essential to living in place is access to broadband. My focus is on advice to architects on incorporating into their work consciousness about the requirements for elderly and disabled individuals. One clear lesson of Wheeler’s speech is that housing with easy access to broadband is essential coming a close second, for those of us who are mobility disabled. to wheelchairs and ramps. “How we connect with friends and family, how our homes use energy; the efficiency of our transportation network; how we elect our public leaders and engage with government; all are impacted by our new networks. “Here at Ohio State there was a dramatic example of how networks are changing old practices when Dr. Christopher Kaeding donned Google Glass to conduct a surgical operation that allowed medical students located miles away to see through his eyes. “There is another aspect of the new networks that will differentiate the lives of the current crop of students at Ohio State. “Historically, networks have been a centralizing force, pulling users closer to the place where the technology resided. The new network operates in an opposing manner, pushing activities outward to the edge of the network. The result is an explosion in individual opportunity – a re-birth of the entrepreneurial dynamism that characterized the pre-industrial era of our nation. “Enter the Federal Communications Commission. “The FCC is the public’s representative to the ongoing network revolution. “The agency was created originally in 1934 to oversee the third-generation networks of telephony and broadcast and, eventually cable and wireless carriers. “Specifically, Congress charged the FCC to protect – quote – ‘the public interest, convenience, and necessity’ of the nation’s networks. “In serving the public interest, the FCC has focused on dual responsibilities. “First, facilitating dynamic technological change to ensure the U.S. has world-class communications networks. “Second, ensuring that our networks reflect our civic values, most notably our belief that communications networks should be accessible to all. Wheeler’s complete remarks, available at the FCC site, includes Wheeler’s glee that his alma mater beat its arch football rival Penn State in football. Here in State College where i live WE ARE ALL PENN STATE. Despite Tom’s position on the wrong side of football, I trust that Tom Wheeler is on the right side of broadband policy for the poor, elderly, and disabled. The year the World Trade Center was bombed in New York, Alan Jackson won the Country Music Award for his song about the tragedy. This intensely country music perspective on the Twin Tower Tragedy demonstrates the breadth of the Tragedy for the U.S as a whole. This is a tragedy equivalent in significance to the United States when the Japanese bombed Pearl Harbor. Pearl Harbor convinced Congress formally to declare war and have the United States enter World War II as a critically important Ally. Alan Jackson’s song demonstrates the breadth and death of the great grief throughout the United States. When you click on the arrow of this video you will be presented with startlingly vivid detailed images of Ground Zero. You will see the planes crashing into the Twin Towers. You will see the injured and dead. You will cry. If you are not a fan of country music, this video is worth watching in mute just for the graphic portrayal of the Tragedy. I was reminded of this Alan Jackson song when I became interested in the rebuilding at Ground Zero. Now after years and years of bitter debate about rebuilding, Ground Zero construction is taking place. The Master Planner for this massive architecture, engineering, and construction effort is the architect Daniel Libeskind who is both a U.S. and Israeli citizen. “Libeskind is perhaps most famous for being selected by the Lower Manhattan Development Corporation to oversee the rebuilding of the World Trade Center, which was destroyed in the September 11, 2001 attacks. He titled his concept for the site Memory Foundations. Alan JacksonDaniel Libeskinde-architect ukJoel SolkoffRebuilding efforts at Ground Zero with updatesThe year the World Trade Center was bombedWhere were you when the world stopped turning? You will clearly recognize Amelia at the end of the video. She is haming it up holding up a sign that reads “500” and then getting knocked off her feet. Just goes to show what a fine parent I raised her to be. NB Alas, the video is no longr available on You Tube. I have been describing my third cancer experience at age 65 when I was diagnosed in April in State College PA and had a successful operation in August in New York City at Memorial Sloan Kettering Cancer Center. How did I survive cancer three times? How was I able to father two daughters after massive radiation treatment? Why was cancer treatment responsible for my becoming a paraplegic? What was my emotional state during these three experiences which otherwise might have forced me to concentrate on death rather than enjoying life? Answers may be difficult to provide, but what follows is my first attempt to use language for the ineffable. Writing the book was difficult especially revisiting the radiation treatment room at George Washington University Medical Center where the chief radiologist had died from exposure to his own machines. Making the difficult an easy read was also difficult and slow. What follows is Chapter One of Learning to Live Again, My Triumph Over Cancer. 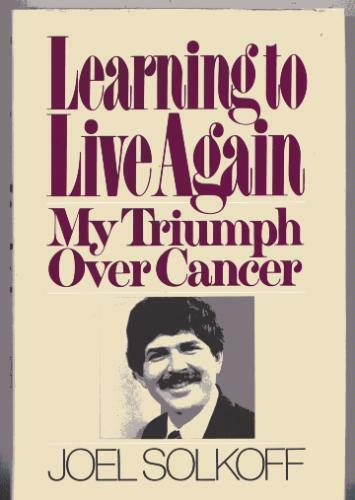 What follows is the entire chapter one of Learning to Live Again: My Triumph Over Cancer, published by Holt, Rinehart, and Winston, then a subsidiary of CBS. It is spring here in Washington. The cherry blossoms are out early. Spring this year feels the same as it did five years ago. I continue to live in the same city and in the same apartment. At thirty-three, I am too young to write my memoirs. Yet that is what I am doing, reliving the period five years ago when I was diagnosed as having cancer and feared death. The diagnosis and its treatment—over a period of six months—was the worst experience of my life. Remembering how poorly I behaved is worse than remembering the physical pain and the fear. Now, five years later, my statistical category has changed. Today I conform to the American Cancer Society’s definition of cured: five years without a recurrence of symptoms. A generation ago my type of cancer, Hodgkin’s disease, was described as “invariably fatal.” A generation ago I could not have survived five years. I would not have lived to interview family, friends, and physicians, nor to revisit the hospital in which I was operated upon and treated. The difficulties of remembering and surviving would have been denied me. ON FRIDAY AFTERNOON, April 23, 1976, I am sitting in a doctor’s office worrying. Worrying is something that I do a lot and am good at. At the time I do not realize that I have much more reason for concern than when I normally worry about (a) money, (b) getting the article in on time, (c) my relationship with Laura, (d) finishing the book, (e) cleaning the apartment, and so on. Specifically, I am in the waiting room of Aaron Falk’s * office because there is a small lump—about the size of a golf ball—under my right arm. The lump does not hurt, and it is noticeable to no one but me. However, it has been there for a number of weeks, and several times a day I find myself feeling under my armpit to check whether it has gone away. The lump has joined my mental list of things to worry about. Given how regularly I worry about my health—running to a doctor’s office at the first sign of a cold, a sore throat, or a backache—I do not anticipate that my first appointment with Dr. Falk will be noticeably different from previous appointments with other doctors. My experience as a mild hypochondriac is that doctors find my ailments boring. I leave their offices feeling embarrassed for bothering them and stupid for paying so much money to find out that there’s nothing wrong with me. Indeed, I have made the appointment because I want to be reassured that nothing is wrong with me. This time I am sufficiently concerned about the lump that I am willing to risk the likely embarrassment and expense. However, the longer I sit in the waiting room, the more convinced I become that the lump is inconsequential and that it will probably disappear if I wait long enough. I am convinced that Dr. Falk, whom I have yet to meet, will be polite, but in a tone that will imply that doctors go to medical school to cure really sick people and why does he have to waste his time seeing obviously healthy people like me. As I read the plastic sign welcoming patients to talk about physician fees with the physician, I decide that now that I am in the doctor’s office, I can stop worrying about the lump and start worrying about money. My concern about money at this time has a rational aspect to it. As a free-lance writer my income is precarious. I have difficulty obtaining insurance. My previous policy, with Stan, a friend of a friend who agreed to let me join his group plan, was terminated because Stan pocketed the payments rather than sending them to Blue Cross. That experience has made me feel insecure about my current plan, with the newly formed Washington Independent Writers. The paperwork is already fouled up. Despite the organization’s reassurance that my membership card has been processed and is in the mail, I worry that I may not be covered by insurance at all. So as I appraise the doctor’s office, which is in an expensive neighborhood, provides free parking for its patients, has its own laboratory on the premises, and offers a spacious waiting room (where a large potted plant has cedar chips covering the soil), I am concerned that the tests and doctor’s fee will be more than I can afford—and all for a complaint that will probably turn out to be nothing. “I’m a writer, specializing in agricultural policy.” We talk about that for a while. We get along instantly. Our ability to communicate seems uncanny. There are not the usual barriers that separate doctor from patient. Dr. Falk is only seven years older than I, so we relate as peers. He is not condescending toward me, as are physicians who make themselves inaccessible because of their specialized knowledge. BY THE END Of the day, I was calling him by his first name, because it seemed artificial for him to call me Joel while I was calling him Dr. Falk. In retrospect, I must have decided to trust Aaron as soon as we met, when I entered his private office and sat down on the wood-and-wicker chair. At the time of this first visit, I knew nothing about his educational background. Dr. Falk graduated from Harvard College and went to the University of Pennsylvania Medical School. I also did not find out, until much later, that Dr. Falk and I shared a similar religious upbringing: he attended the Hebrew Academy of Washington; I went to the Hebrew Academy of Miami Beach. While I soon rejected the ritual and ever-present discipline of orthodox Judaism, Dr. Falk continued to observe it. Indeed given the additional distance I was then putting between myself and Judaism, if I had known about our shared religious background, it would have put distance between us. AARON is the same height as I am-5 feet 10 inches. He is thin and although prematurely gray, he looks younger than he is. Our preliminary small talk clearly makes him impatient, an impatience he has difficulty curbing. He recognizes the necessity of getting acquainted, but fidgets as he sits, uncertain about what to do with his large hands and arms, patently restraining the impulse to dash down the corridor and “do something.” This impatient, almost distracted manner extends to his dress. He is wearing a regulation jacket and tie, but it is that and no more, he looks neither dapper nor even coordinated, his clothes the expression of a man who has more important concerns. He talks in spurts, the way professors do who are more comfortable with scholarship than students. Sentences are strung together rapid-fire, followed by long pauses while he weighs each word. He suspects that he’s transparent and that everyone knows what he’s thinking when he’s thinking it. So Aaron smiles a lot during his embarrassed pauses or when I am talking too long, as if to say, Dealing with people comes awkwardly, but I want you to like me. The smiles work. His eyes light up, expressing interest, even tenderness. I must be more frightened than I realize. Rather than say, “Single and divorced,” which is how I usually automatically answer the question, I launch into an exposition on the intricacies of New York State’s divorce laws, which five years previous made it more convenient to get an annulment than a divorce. When I respond to a simple question with a long, irrelevant answer, it means that I don’t want to deal with whatever’s going on. After I take off my clothes, he feels the lump under my right arm, asking whether it hurts as he touches it. It doesn’t hurt. Kneading my skin with his fingertips, he feels for lumps under my left arm, under my ears and behind my neck, across my abdomen, and at my groin. There aren’t any other lumps. He asks, “Do you have sudden chills or wake up sweating in the middle of the night? “Have you been running a fever? “Do you have sudden outbreaks of itching? “Have you recently experienced sudden and unexplained weight loss? As I am crossing L Street and New Hampshire Avenue, it does not occur to me to question why I am listening to this doctor’s urgent instructions or why I trust him. I am puzzled because never before has a physician taken my physical ailments quite this seriously. Fear is creeping up on me, fear because the doctor has asked me specific questions and because it seems that I have a specific disease; fear because he says he specializes in disorders of the blood and by implication that’s what I may have; fear because I am en route to a surgeon. I have never had an operation, and I’m a coward when it comes to pain. Fear because a doctor thinks that an operation is necessary at all. But I don’t actually feel frightened yet. I can tell that the fear is coming, but am able to put it off, not wanting to be afraid, too busy concentrating on getting to Simpson’s office and on obtaining as quickly as possible a new range of information that I’ll need to deal with this situation. I know that I’ll be frightened later, but for the moment my curiosity is stronger than the fear. I consciously decide—like Spock in “Star Trek”—to banish my emotions and concentrate on being logical. Simpson is also not much older than I. He is tall, thin, and wears a tapered three-piece designer suit. Among George Washington University medical students, who are notoriously hard on their instructors, he has a reputation for being a very fast and very good surgeon. Right away, I find him to be unpretentious and easy to understand. He feels the lump under my arm and says that he doesn’t think there will be any problem removing it. He reassures me that the operation won’t be painful (which I don’t believe), that I’ll be awake while he does it, and that I can return to work right away. SIMPSON’S ATTITUDE toward me, from the beginning, was matter-of-fact. Later, he told me, “In reality, as a surgeon I was actually put in the position of being just a technician. I was not making major decisions regarding your care. The major decisions were really made by Dr. Falk—and you, of course.” He explained that surgeons, like anyone else, would prefer to be creative and in a position of authority. Instead, as often happens, he was asked to do a routine task which he had done hundreds of times before. He was perfectly willing to explain the procedure to me and consistently answered every question asked about surgery and possible complications. However, regarding speculations on my diagnosis and life chances he continually referred me back to Aaron, whom he regarded as my primary physician. Whenever I asked whether he thought a procedure Aaron recommended was necessary, he said yes, telling me that Aaron was a respected physician who specialized in conditions like mine and whose judgment was trustworthy. Simpson and I never became friends, as opposed to my relationship with Aaron. I still don’t know Simpson well, and I doubt that many people do. Yet I respected him. He was easy to be with during painful and stressful situations. Like Aaron, he has an off-beat sense of humor, which we shared and enjoyed, and while there was nothing memorable about our jokes and bantering, it made future events easier that we all “horsed around” (as Aaron put it), often in a self-deprecating way. Given the closeness in our ages, none of us took offense or felt threatened when I complained about Simpson’s sutures or Aaron’s plans for treatment or when they complained about my behavior. Had they been much older, or had I been much older, my relationship with my doctors would have been more decorous—making the whole experience grimmer. I am frightened by the word tumor. Having assumed that I’d never have to deal with a tumor, each time the word appears in conversation I tune it out. “If it’s benign, why is it swollen?” I ask Aaron. “All tumors are enlargements, abnormal growths. Most just happen, for reasons which are complicated and about which we’re not entirely sure. “And if it’s a serious tumor?” I don’t want to say the word cancer. We talk about scheduling for the operation. He wants the tumor out of me as quickly as possible. I realize that walking around worrying that I have “something serious” when I probably don’t is stupid, and the sooner I know the better. But I don’t want someone else or something else controlling my life. I have an article to complete on Cesar Chavez, which Marty Peretz, the owner of The New Republic, commissioned and is expecting. Already, I am beginning the process of negotiating, trying to fit the problem of my tumor into my schedule. Aaron says firmly, “Don’t wait too long. This is something that should be taken care of right away.” I promise to call Simpson’s office and schedule an appointment. * While all characters in this book are real, several names have been changed. This material is copyrighted © 2013 by Joel Solkoff. All rights reserved. Here is Tim McGraw singing on just this very subject.